Have you received your pack of the “M × L × B × D” Edition? Here are some pictures of the two 3-packs that I purchased from the Field Notes website. FYI, unlike most of my previous Field Notes posts, this will be mostly photo-centric, with just a few observations and notes from me. You can find more details on this edition at the links listed near the bottom of this post. The turquoise foil on the cover is just gorgeous. I'm a fan of foil-stamped editions. :) By the way, product description calls this “Babe the Blue Ox” foil, but the specs printed on the back cover say “Totally Turquoise”. As in other DDC issues, the front inside cover has a DDC pattern all over it, but this time it’s a diagonal pattern (loop of the text “DDC × MONDO × LANDLAND × BURLESQUE”). A very dynamic detail that I like a lot. You can also find this pattern on the inside of the belly band, printed in matching turquoise foil. Swoon. The cover paper is French Paper Construction 100# in “Recycled White”. We saw this previously in Day Game. 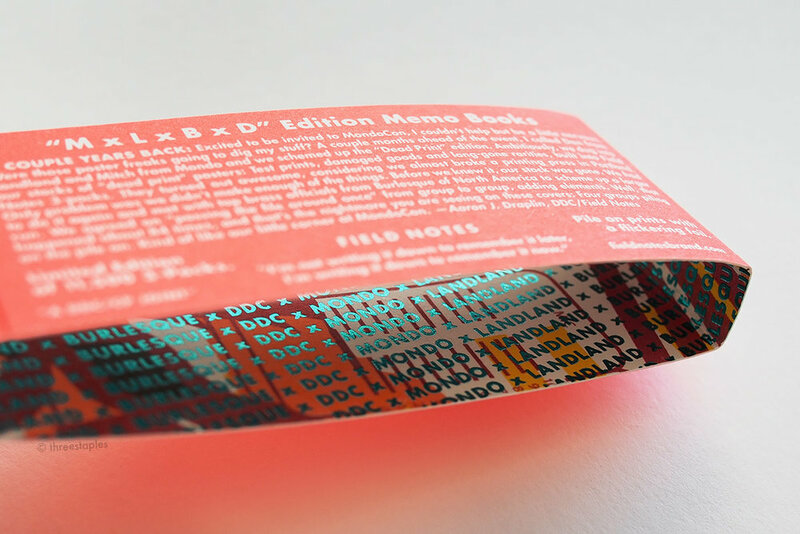 The DDC-branded editions usually use Accent Opaque 50# for the body paper, and this “M × L × B × D” edition is no exception, specifically in “Absolutely Alabaster”. The DDC Pop-Up edition and the Dead Print edition also list this exact same color. The edition size is 11,500 3-packs. That seems like a lot for a special edition. For comparison, Resolution (the latest quarterly edition) was 35,000 packs. Has a DDC-branded edition (item no. “DDC-054”) ever been sold through the Field Notes website before? It’s interesting because my memory says no. My order of 3-packs from FN came with a free pencil: their new red Valentine’s Day pencil. It was a nice surprise, as I was under the impression that it would be included with orders placed during the following Valentine’s Day week. Yay! Turquoise foil on the inside of belly band. The “Open All Night Sign Neon Red” on the inside cover is not showing up properly in this photo, but it really is fluorescent. The far right book with “U.S. Post Office” is my favorite. Extra Staples is a series of posts where I share various links I find interesting. It is not on any regular schedule, and the links can be old or new. For more frequent updates from me, please find me on Instagram and Twitter, under the same moniker, Threestaples. A collaboration between Field Notes and Bellroy, an Australian company that specializes in wallets. Looking quite compact and sharp! I am especially intrigued by the magnetic closure. Not 100% sure but it looks like the cover comes with 3 custom Bellroy-brand memo books in the form of one single + one 2-pack (according to the belly band in the pictures). Interesting! I love duplex covers, so this news is pretty exciting. And it’s cool that the price for the standard size is still $9.95 and that they’re offering both sizes in both ruled and dot grid. I’m still weary of the larger size though. I wonder how stiff the new cover is because the cover stock for Arts & Sciences did not work for me at that size. Anyway, au revoir, old Pitch Black. I’ll miss you all the same. Another thorough review from Michael at Lead Fast. These Field Notes look nice but perhaps I made the right decision to not buy them. Awesome Field Notes wallpapers created by designer and Field Notes enthusiast Dennis Cortés, presented in a beautiful site. I say it’s a mandatory bookmark for any FN fan (I’m adding it to my Links page). An awesome interview with Caroline Weaver of CW Pencil Enterprise that I enjoyed a lot. Community Member Spotlight: Andy Welfle — the weekly pencil. A great idea for a series, starting with Andy Welfle, from The Erasable Podcast. Fantastic looking pencils, made by Staedtler for the Japanese market. They’re for kids but I wouldn’t care. Very tastefully designed, even though they may be somewhat gendered. Interesting but I still can’t understand what Polaroid is trying to do. This is a graphite/vermillion colored pencil combo made by Caran d’Ache for CWPE that I’ve been using it for editing my writing. It’s quite a workhorse! The red is a nice middle of the road shade between cool red and orange, and it doesn’t take too much effort for the color to show up on the paper. Not as dark and effortless as the Uni NanoDia red pencil but still very good. The graphite end is on the hard side but quite smooth. 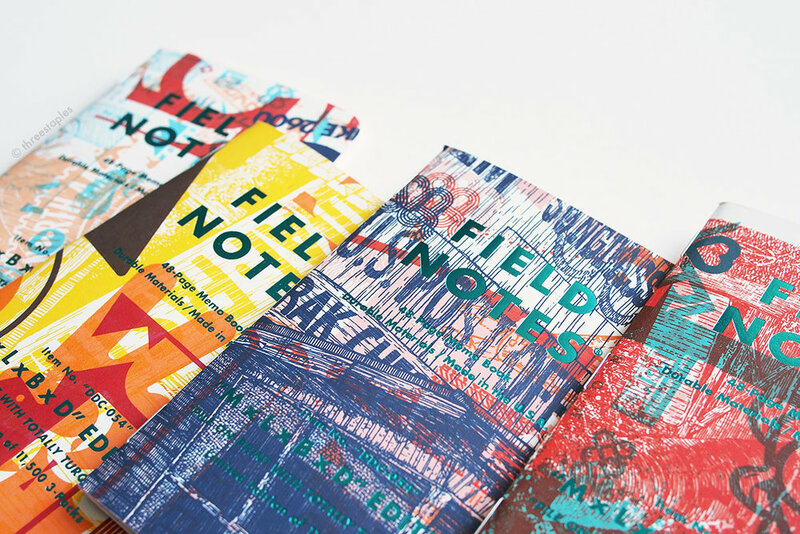 Aaron Draplin, the co-creator of Field Notes, now has a font family under his belt, at one of my favorite font sites. For personal use, you can get it at a pay-what-you-want price. Colorful paper art installations for a new Hermès store in Dubai, by a team of two French artists. “A dense metal mesh constructed from 132 binder clips (and pliers).” Amazing!